The independent filmmaker, sound researcher and wanderer Vincent Moon will be back at Wolf for a one off audiovisual performance and the German premiere of his feature film‚ "Hibridos, the spirits of Brazil" - co-directed and produced with Priscilla Telmon. An ethnographic journey into the world of sacred ceremonies and their diversity, as well as a trip into cinema as a pure poetic language. 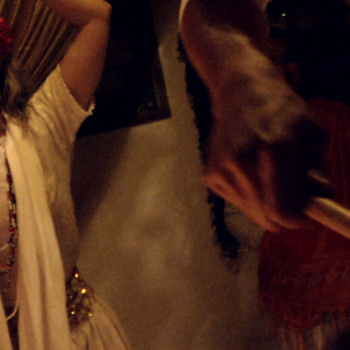 Without any voices paving the way, only the sounds of the rituals and the chants of the devotees, Híbridos is a music film of a new kind. Wolf and Piranha Records are excited to welcome Vincent Moon to Berlin again and invite to this immersive and intimate experience. On August 21: Vincent Moon will create a site-specific trans-cinema experience by editing in real-time a unique version of Hibridos at Wolf Studio 6. On August 22: German premiere of the feature film‚ "Hibridos, the spirits of Brazil" followed by a Q&A with Vincent Moon at Wolf Kino. On August 25 & 26: Re-runs of "Hibridos, the spirits of Brazil" at Wolf Kino.